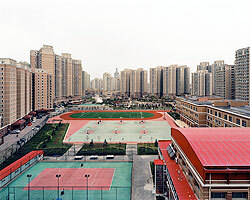 The district of Chaoyang (a prime area) is beautiful and popular with both locals and visitors. A good number of embassies and many high-end businesses are based in Chaoyang. The district is bursting at the seams, with a population of over 2.2 million. Beijing’s Central Business District takes up a good portion of Chaoyang, and is home to 3,000 foreign and local companies as well as a good number of international luxury hotels. There are also deluxe residential areas and recreational facilities. The decadent San Li Tun area is pleasant for an afternoon cocktail in one of its many bars, or a relaxing cappuccino on a sidewalk cafe. It has shops selling all sorts of interesting goods and a market for bargain hunters. At night San Li Tun becomes a haven for partygoers. Those tiring of San Li Tun can hop over to busy Chao Yang Park. A favourite with Beijing’s expatriate community, this area is lined with pubs, restaurants, shops and upscale bars. There’s an interesting artistic community in Da Shan Zi. Once factory grounds, this vibrant warehouse area is now home to sculptors, painters and everything in between. Central to the area is the 798 Space, popular for hosting fashion shows, exhibitions and other events. Walking through this part of town brings a quiet stroll along tree lines roads and whimsical pieces of art. Other popular parts of Chaoyang are Jian Guo Men Wai and Ri Tan. Here one will find a great medley of people; local and foreign, businessmen and blue collared workers. Jian Guo Men Wai Avenue is bustling with vendors offering rickshaw rides and all sorts of curios, businessmen and women shuffling to and from work, locals as well as tourists. There are hotels and office buildings, as well as the crowded and popular bargain heaven, Silk Alley. Ri Tan is a peaceful area with many diplomatic institutions, and the calm Ri Tan Park, where many sit by the lake and enjoy the morning air with a cup of coffee in hand. Other facilities in Chaoyang include the China World Trade Centre, Dongyue Temple, Worker’s Stadium, International Conference and Exhibition Centre and the Yansha Shopping Centre.